Riding in the Zone is an advanced rider training school, offering on-street, dual-sport training tours and advanced parking lot courses. Ken is an author and journalist of two books and multiple skills articles that help riders become more confident and safer. Motorcycling is not forgiving of mediocrity. Thankfully, becoming a better and safer rider is achievable. Riding in the Zone can help by providing advanced training and education to motorcycle riders of all levels who want to advance their skills. 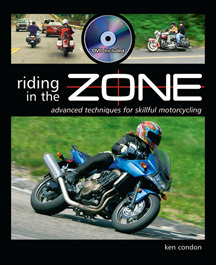 Riding in the Zone is a 143 page full color book includes a 30 minute DVD with parking lot drills to advance your riding ability. RITZ will help beginner, intermediate, and early-advanced riders to develop the physical and mental skills that are necessary to ride with more confidence and enjoyment. There are a lot of motorcycle riding skills books out there, but what sets Riding in the Zone apart is how it explains complex information in a clear and concise manner. To further help explain the concepts and techniques discussed in the book, an instructional DVD is included and you’ll find demonstrations of practice drills to help you implement the lessons quickly and easily. Get an autographed copy when you buy from my website. Take a look at some sample pages and two video clips from the DVD. Riding in the Zone BLOG has also become a resource for motorcycle riders who enjoy reading about all types of topics, including rider training, how to setting up a motorcycle for track days, and riding technique to name a few. Riding in the Zone is an active partner with Tony’s Track Days in running and coaching at Motorcycle track days in New England. Not sure a track day is right for you? Read this. Also,check out the special Non-Sportbike Track Days. On- Track Personal Coaching is available. Not all products for motorcycle riders are created equal. Visit the PRODUCT RECOMMENDATIONS PAGE for quick links to products Ken personally uses. Buy through the site and help support RITZ.